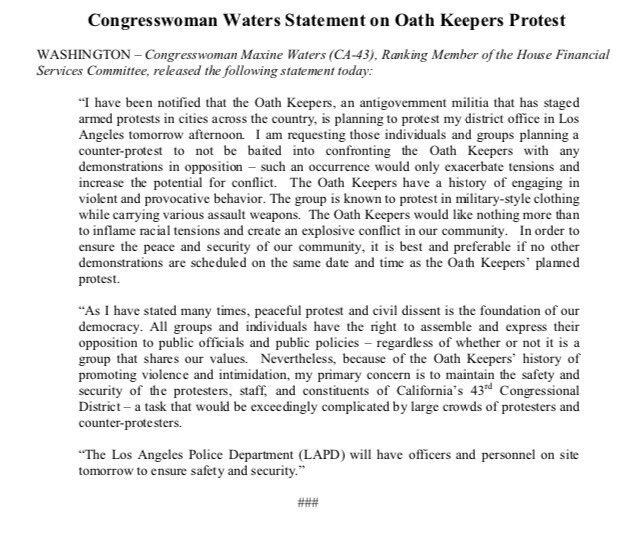 Plans for the Oath Keepers to stage an “indefinite” protest at California Rep. Maxine Waters’ congressional office in Los Angeles were scrapped at the last minute on Thursday to avoid confrontation with counter-protesters who had gathered by the dozens. The protest, announced earlier this week, was both “against Maxine Waters’ incitement of terrorism, and a stand FOR ICE [Immigration and Customs Enforcement] and the Border Patrol, as they enforce the perfectly constitutional immigration and naturalization laws of this nation,” a call-to-action posted on the group’s website read. But as the time for the protest arrived, there wasn’t an Oath Keeper in sight. “[A]uthorities had been in contact with the group, and it had decided not to come in order to ensure peace,” the Los Angeles Times reported. Instead, counter-protesters had gathered by the dozens and remained long after the Oath Keepers bailed on their promise to appear. At one point, they doused a small flag they had taken off a pickup and set it on fire, chanting, “America was never great,” the newspaper reported. While the Oath Keepers have proven capable of mustering large numbers of supporters, this isn’t the first time national and state leaders have issued a call-to-action only to find an unenthusiastic response from members, many of whom are former military and police personnel obsessed with far-right conspiracy theories. Last February, after Nikolas Cruz killed 17 students and injured more than a dozen more at Marjory Stoneman Douglas High School in Parkland, Florida, the Oath Keepers called for members to stand armed guard at schools across the nation. According to news media accounts, at least one Oath Keeper stood guard, outside a school in Indiana. In January 2017, the group called for Oath Keepers to provide security at President Trump’s inauguration. But only a dozen or so people came. Those that showed up had plans to comb the crowd, looking for suspicious behavior from political opponents on the left, and anyone who appeared to be a member of ISIS. Such a lackluster public presence isn’t always the case, though. Oath Keepers came out in force last summer to provide security for ACT for America, an anti-Muslim hate group that claims to have more than 500,000 members, when the group hosted rallies protesting Islamic law in more than 20 cities, including New York, Dallas and Atlanta. The Oath Keepers were also critically involved in public lands disputes across the West, beginning in 2014 when militia members came by the hundreds to support Nevada cattle rancher in what escalated into an armed standoff in April 2014.